You know those foods that you love at restaurants or from the grocery store that you just can’t ever seem to replicate back at home? You buy the best ingredients, you follow a recipe, you really…REALLY try hard to recreate that original flavor, and you get close…but somehow it just misses the mark? You know what I’m talking about. Well today, I’m going to tackle three of those. 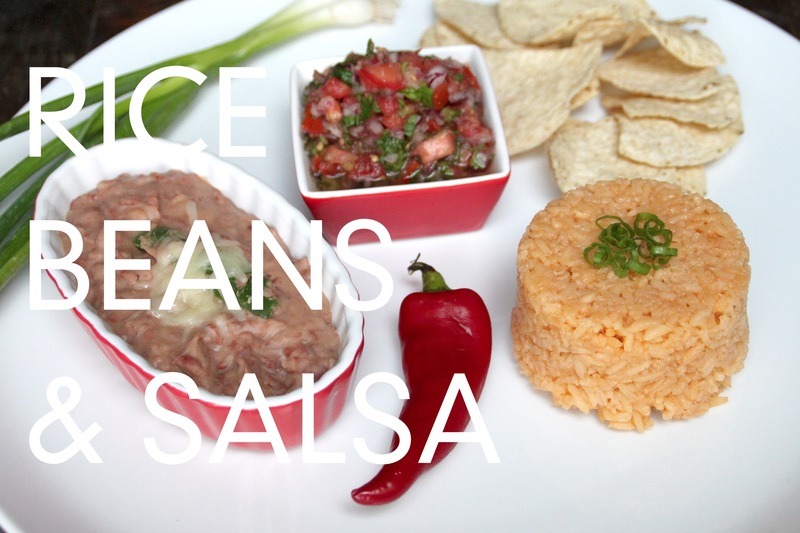 I have never been able to make authentic (or at least “restaurant tasty”) rice and beans, and my salsas always seem to lack flavor or end up too salty or acidic. So I implored the help of my two favorite sidekicks… my best friend and my husband. 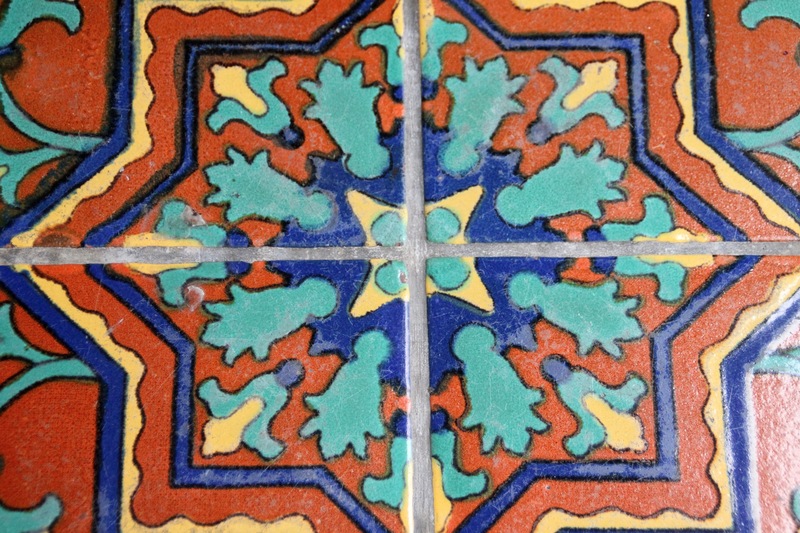 In our circle of friends, Melinda is the authority on Mexican Cuisine (well, she’s pretty much a culinary genius on all fronts, but Mexican is definitely her forte) and everything she makes is always so tasty. 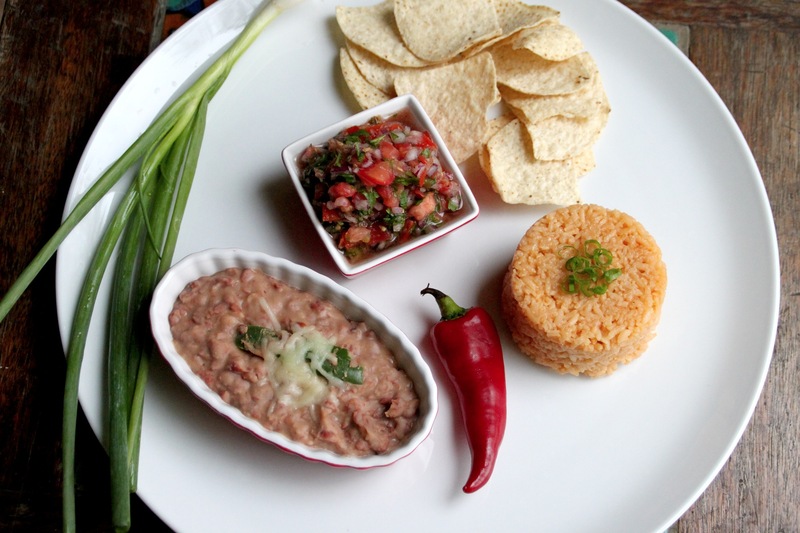 But above all, her rice and refried beans are my absolute favorite. 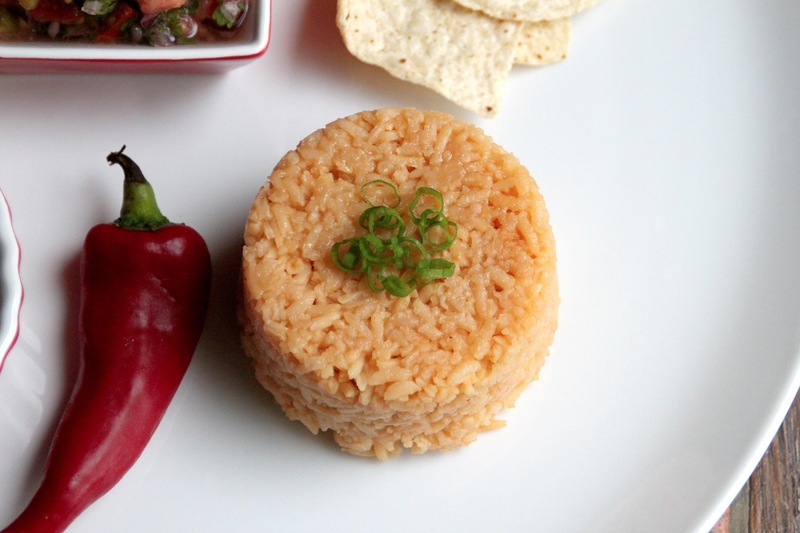 So, I asked for her secret and she gave me the fool-proof, easy to make version of her famous rice and beans. Heat oil over medium heat in a standard pan. Add rice and stir until browned, about 3-5 minutes. Stir in the Knorr Bouillon making sure all lumps are dissolved. 2 40oz cans of SUN VISTA pinto beans, strain and reserve the liquid. 2 jalapeños, cut into quarters lengthwise, veins and seeds removed. vegetable oil (I used canola), enough to cover the bottom of a large frying pan. Heat a large frying pan over medium heat and coat the bottom with vegetable oil. Add jalapeños to hot oil and stir the around to infuse the oil for about 3 minutes. Make sure to not let them burn. Add strained beans and stir for another 3-5 minutes. Lower heat to a simmer. Using a potato masher, mash beans. Add reserved liquid as needed to keep the beans moist. 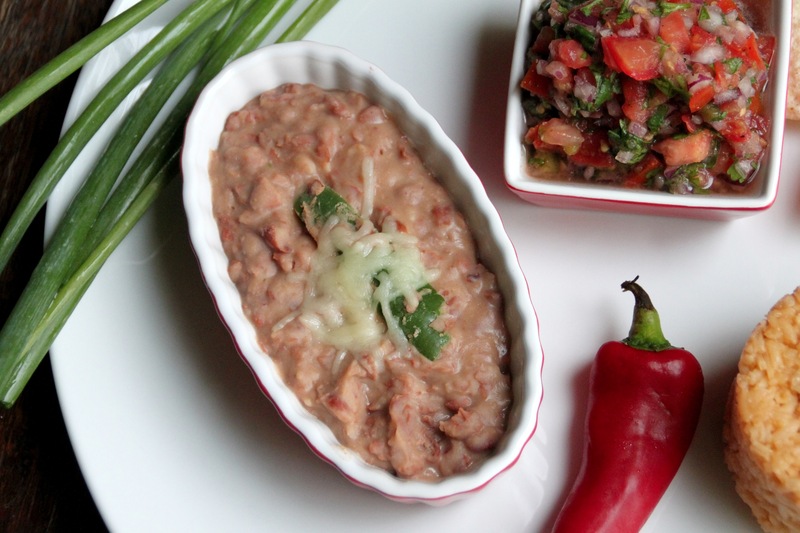 As the refried beans cool, they’ll dry up so it’s better to make them a little runnier than you’d serve to start. Garnish with a little cheese. Evan is an experimental cook. He often whips up amazing, jaw-on-the-floor deliciousness that I can’t wait to eat again and again….and then other times, he makes…red wine soup. No comment. Let’s just say, when he’s on…HE IS ON! And when he’s off…well, did you not just hear me say red wine soup? Since he is such a fly by the seat of his pants kind of cook, he’ll often write down the winning recipes so that he can come back to them. This fresh salsa is one of them. 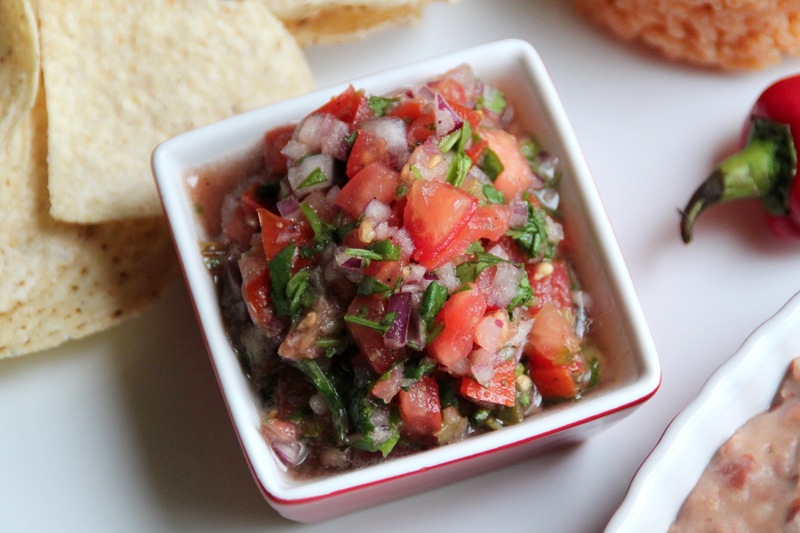 Hands down, one of the best and easiest salsa’s ever. It’s one of those recipes that you can adjust to your taste so feel free to use it as a guide (although I think it’s perfect just like it is). Meanwhile, prep your tomatoes, onion and cilantro and place in a medium-sized bowl. Add diced jalapeño (seeds too) and lime juice. Let sit in the fridge for about 30 minutes. Adjust flavors if needed before serving. Can’t wait to try these – I love Mexican food. Please do, I think these recipes are so wonderful and easy. Def going to have to try these! Thanks for sharing, looks delicious! You’re welcome, Melanie! I hope you enjoy, they’re all so yummy! Looks so good. I will definitely be trying those recipes!